So last night was a very interesting VMA when Beyonce took the stage in an unusual outfit ( for her) normally we are used to seeing Bey with revealing outfits and her prancing around on stage, but last light she switched it up, her performance was not lacking at all though , her voice was very powerful and the songs was hot to say the least. However it was her revelation after the song that took the cake , Bey opened her' jacket and revealed her baby bump in high fashion like only Bey can, and it was a shocker to most. But I had suspected that she was pregos after seeing a performance she did days before when her stomach was covered up. 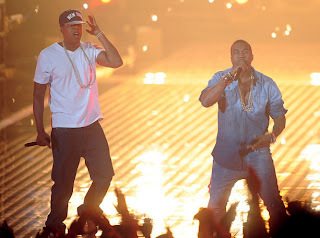 Anyway as she revealed to the audience her good news, her husband Jayz and bFF Kanye were shown backstage jumping for joy. 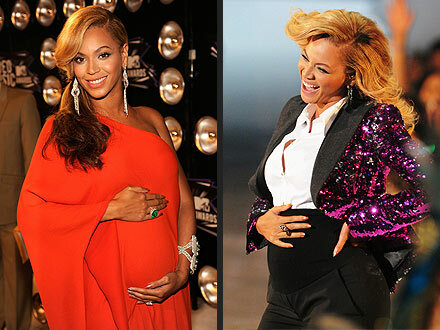 I am truly happy for Bey and Jay and wish them the best pregnancy ever Congratulations!! Jay and Kanye on stage prior to Bey announcement.